305 mm/45 Mle 19106 х 2 pcs. 180 Degree Turn Time60 sec. Initial HE Shell Velocity905 m./s. Initial AP Shell Velocity798 m./s. 139 mm/55 Mle 191022 х 1 pcs. Initial HE Shell Velocity840 m./s. 75 mm/50 Mle 19228 х 1 pcs. 13.2 mm/76 CAD Mle 19298 х 2 pcs. 13.2 mm/76 Mle 19298 х 1 pcs. Courbet — French Tier IV battleship. The first battleship-dreadnought built in France. The ship carried twelve 305 mm main guns and powerful secondary guns. Her sides were reinforced with vast armored areas. Her disadvantages included weak torpedo protection. Astoundingly long range for her tier, at 17.4 km. She can easily bring five guns on target at a time. Armor works decently well at its tier. Lowest hit pool out of the tier 4 battleships. At 21 knots, she isn't going to break any speed records. Anti-aircraft batteries shouldn't be trusted to turn away a strike. Hull: Upgrade to Hull (B) for a handful of additional hit points, a small bump up in AA capability, and quicker rudder shift speed. Research of this module unlocks progression to Bretagne. Gun Fire Control System: Upgrade to PCA n° 4 Mle 2 for an extra 10% range on the main battery. Propulsion: Courbet’s upgraded engines bump her top speed to 21 knots. Upgrading to Hull (B) first is tempting, but captains are encouraged to invest in the range and speed upgrades first, or they risk not being able to actually enter combat on certain maps. The additional 2,800 hit points offered by Hull (B) are not a bad thing, but represent less than one full shell penetration from enemy battleship AP at this tier, and will not make or break a game; neither will the handful of extra AA guns she receives against Tier IV and V aircraft. Key skills for Courbet commanders include Expert Marksman, Basics of Survivability, and Fire Prevention. 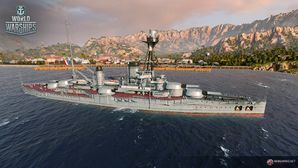 As a Tier IV ship, it is highly recommended to save signals for use in the later tiers. But should the player have a surplus and enjoy playing this ship, they should utilize the following recommended signals. Equal Speed Charlie London ( ), Zulu Hotel ( ), and Dragon Flag ( ) signals are recommended for faster commander (re)training. Courbet in 1939 after a major refit in 1937-38. Courbet was completed on November 19, 1913, and ready for service in the Marine Nationale before the outbreak of the First World War. 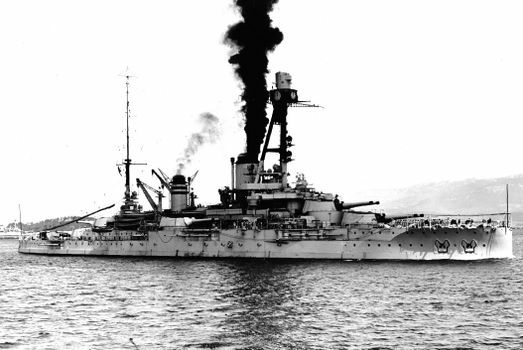 She joined the 1st Division of the 1st Squadron of the Mediterranean Fleet based in Toulon upon her commissioning in 1913, where she assumed the mantel of flagship under Vice-Admiral Augustin Boué de Lapeyrère from the beginning of the war, to April 12, 1915. Her first act of duty was to sail into the Adriatic and surprise the blockade of Austrian vessels at Montenegro. Part of the Anglo-French force, which included her sister, Jean Bart, succeeded in sinking the Austro-Hungarian cruiser Zenta in the Battle of Antivari on August 16, 1914. The rest of the war saw no action for Courbet. During the Interwar period, she was the flagship for Vice-Admiral Charlier between June6, 1919 and October 20 1920, where, in the following year she was reassigned as a gunnery training ship at Toulon. In June 1923 she had a massive boiler fire which necessitated repairs, during which she received the first of her upgrades, including replacing one set of boilers for oil-fired boilers, trunking her forward funnels together, the installation of a new tripod mast and new fire-control directors and rangefinders. She had another massive refit between January 15 1927 and January 12 1931, much more extensive than the previous one. Another set of her boilers were switched to oil-firing, her high and medium pressure drives were replaced by geared turbines and her fire-control systems were upgraded once again. She received a new cruiser type fire-control director atop the foremast, a new rangefinder replacing the one atop the conning tower, her secondary armament received fire directors as well as one on the roof of B turret. Her AA guns were replaced by newer model guns and received rangefinders for them as well. After this major refit, she was transferred from the gunnery school to navigation school in 1937, before the final refit she had, between April 1 1937 and September 19 1938, saw her torpedo tubes removed and her boilers overhauled and was sent back to be a gunnery training ship in 1939 until the outbreak of World War II where she was ordered to Brest with her sister Paris. Courbet and her sister Paris formed the Fifth Squadron upon the outbreak of war, and were transferred to the Atlantic to continue training without incident. In May of 1940 they were returned to operational status and given a few more mounts at Cherbourg. Courbet then provided gunfire support in the defense of Cherbourg against the advancing German army covering the evacuation of the town, though it was not particularly effective. Courbet then sailed for Portsmouth in June, where she was seized as part of Operation Catapult by the British in July and promptly turned over to the Free French Navy. In their service she was a depot and anti-aircraft ship in Portsmouth until March 31 1941 when she was disarmed. In April 1944 she was deployed as a target ship in Scotland at Loch Striven. She was used as a target and depot ship until the Invasion of Normandy where she was sailed out to be used as a "Gooseberry" breakwater at Sword Beach. She was towed from Weymouth on June 7 an was scuttled on June 9. She was scrapped in place after the war. Courbet is depicted in modernized, post-1924 condition. Her original 1913 configuration does not appear in the game. This page was last modified on 13 March 2018, at 15:47. This page has been accessed 19,435 times.